When Sample Room came out with natural and organic samples last Earth Day, I can't help but try them. I'm not as into natural and organic products, as you know, and I thought that sampling it first is a better idea than committing to the full size bars. After all, not all products that are organic and natural come in a budget-friendly price. So sample away I did the SoTrue Lavender Oatmeal Castile Soap and got them right on time for my Boracay trip for the Smart Live All Out Event. For a sample bar, it was quite generous. Around 3 x 2 inches that lasted me the 3 days 2 nights trip. I've been intrigued by the castile soaps since i found that it was a good alternative to shampoo or detergent for cleaning brushes that I now use as body wash. I use the Dr. Bronners Castile Liquid Soap which is mighty expensive but I buy it anyway it being the most accessible. And since I'm over the online search for alternative, I was happy to stumble upon this on Sample Room. Castile Soaps are saponified olive oil that effectively cleanses the body off of bacteria but doesn't strip off the body of its natural oils and rather moisturizes it better for smoother more supple skin. Unlike mass-produced soap that contains harsh ingredients, castile soaps are safer alternative for the skin. Better for those with sensitive skin like babies and those who suffer from skin rashes and the likes. Lavender Oatmeal Castile Soap seems to be weird combination but thinking about it, Lavender helps with inflammation and it's calming. While oatmeal is great ingredient for very sensitive skin and provides mild exfoliation for skin renewal. As a soap to use during a beach trip, the lavender helps soothe the skin and makes for a more relaxing scent (great for getting a good night sleep) and the oatmeal helps with skin sensitivity like sunburn or sun rashes. 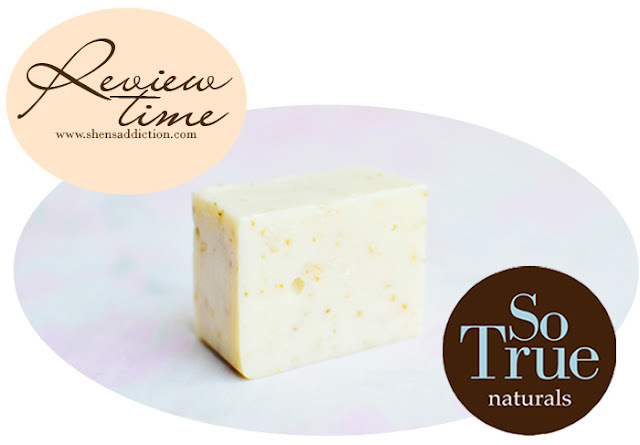 The scent was right for me to want the full-size bar but seeing that the soap didn't melt as fast as other naturally-made soap, I am now looking forward to my purchase! I also got the SoLuxe Peppermint Cinammon variant for Gentlemen but I'm planning to use it for myself. I'm not sure if SoTrue recommends it for female or baby skin but I hope it's okay. And I wish they have more variants to choose from and that they come out with a liquid form for cleaning makeup brushes and besides, it's more handy for travelling. To try samples, visit Sample Room website. To know more about SoTrue Lavender Oatmeal Castile Soap, click here.